WASHINGTON, D.C. -- U.S. adults who report eating healthy all day "yesterday" are 34.1% less likely to currently have depression than those who say they did not eat healthy. Healthy eating is also associated with a reduced likelihood of having other chronic diseases such as obesity, high blood pressure, high cholesterol, heart attack and diabetes. 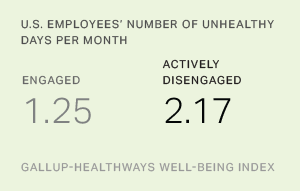 These results are based on more than 177,000 interviews with U.S. adults from January through December 2016, as part of the Gallup-Sharecare Well-Being Index. 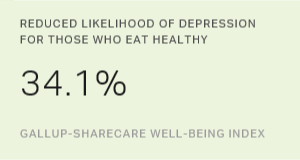 Gallup and Sharecare ask respondents whether they had eaten healthy "all day yesterday." The survey does not measure long-term eating habits, so it is unknown whether a respondent had only eaten healthy the previous day or if they have a long-term pattern of eating healthy. But each day of healthy eating may have a cumulative effect in reducing an individual's likelihood of developing chronic diseases. Obesity is calculated using respondents' self-reported height and weight to calculate body mass index (BMI). A BMI calculation of 30 or greater indicates obesity, according to the U.S. Centers for Disease Control and Prevention. To determine diagnoses of depression and chronic diseases such as high blood pressure and high cholesterol, respondents report whether they have "ever been told by a physician or nurse" that they have the condition. While there is a strong link between unhealthy eating and chronic diseases, the cause of that relationship is unclear. Americans who eat healthy may also practice other good health habits such as exercising regularly and effectively managing stress, which further reduce their likelihood of developing chronic diseases. The link between unhealthy eating and chronic diseases underscores the importance of having good eating habits. But Americans do not appear to be making positive changes to their diets. 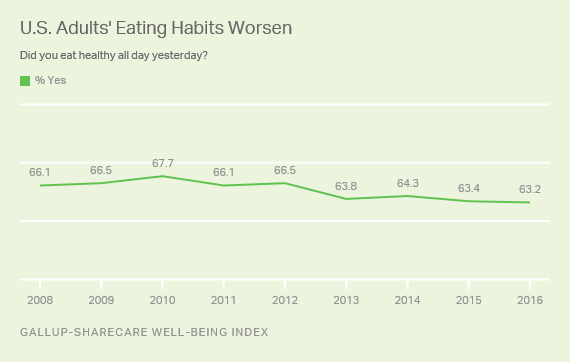 The 63.2% of Americans who reported eating healthy all day "yesterday" in 2016 is the lowest since Gallup and Sharecare began measuring it in 2008. Healthy eating has long been associated with better health outcomes -- and these results confirm the relationship. With obesity, diabetes and depression rates on the rise, it is clear that improving eating habits is a worthwhile goal for public health officials, leaders and families. Community and workplace support can play an important role in helping individuals adopt healthy behaviors. For example, the Blue Zones Project helps communities make positive changes such as increasing the availability of fresh produce through grocery stores and farmers markets and swapping out non-nutritious food for more healthy fare in vending machines at workplaces and schools. In 2016, the Blue Zones Project helped the NCH Healthcare System in Naples, Florida, eliminate all sugar-sweetened beverages from vending machines and cafeterias. The healthcare system also began offering workers smaller portion sizes and replaced cookies with fruit in checkout lanes. In addition, employers can develop corporate wellness programs to nudge employees toward better eating habits. These programs often share recipes and tips for healthy eating. Some programs "challenge" employees to eat healthy for a defined period, helping to ingrain behavior changes for better health. Friends, family members and even employers can all play a part in helping individuals maintain better eating habits to reduce their chances of being diagnosed with a number of chronic diseases. These changes can have positive and lasting effects for the U.S. economy, workplaces, families and individuals. Read more about healthy eating in the "2016 Community Rankings for Healthy Eating" report. These results are based on telephone interviews conducted Jan. 2-Dec. 30, 2016, as part of the Gallup-Sharecare Well-Being Index survey, with a random sample of 177,192 adults, aged 18 and older, living in all 50 U.S. states and the District of Columbia. For results based on the total sample of national adults, the margin of sampling error is ±0.28 percentage points at the 95% confidence level. All reported margins of sampling error include computed design effects for weighting. U.S. workers with diagnosed heart problems are more likely than their peers to report trouble concentrating at work.